I had to use Spotify to listen to the album as I don’t even own a copy (I used to, but sold it on eBay moons ago – I had to do this with ‘Hours…’ also). It was relatively still like listening to it he first time, as I probably haven’t listened to it since 2004. And even then I must have only listened to it five times at the most. I’m still unsure about New Killer Star. I think I like it…It’s certainly not the strongest track on the album, in my humble opinion. But it’s catchy. I’m sure it would grow on me again (I had this love/hate relationship with it before). Not so sure about the Flamenco guitar (all to do with the Spanish roots of Picasso I assume), but once the song gets going proper, there’s a little indie-esque feeling to it. It reminds me a little of Andy Warhol off the Hunky Dory album (although the song is not written by him). And the electric guitar makes it sound a little U2 and stuck in the early ‘noughties’, but I don’t mind it. I like Bowie’s sort of punk singing. Not sure about The Loneliest Guy. I like the melancholy, but worried it might be a little too slow – or that Bowie’s vocal is too slow and a bit weak…listening to it again now – nah! I do zone out bit on this one. Maybe more listens would make it grow on me, but I’m not sure I could endure more listens. I like the punchiness of Looking For Water – and that chorus always gets stuck in my head. It’s short and sweet. I seemed to remember not liking She’ll Drive The Big Car much, and it DOES start sort of slow, but I do like the chorus. I definitely liked it more than I remembered upon the Reality release. Not a fan of Days…I mean he’s obviously apologising to someone (Terry, perhaps, I dunno) but I find it a little wishy-washy. But then I absolutely fell in love with Fall Dog Bombs The Moon last night. Absolutely chalk and cheese between those two tracks for me. There’s something a little Neil Young meets The Pixies or something with this track for me. I can only assume it’s Earl Slick’s guitar on the track as it sounds so familiar? Simple riffing, but I really like it. The hit and miss ratio of Bowie covers is on the ‘hit’ side for a change. Again, I’m not familiar with the Ronnie Spector original of Try Some, Buy Some (which is not a bad thing to come into Bowie covers blind and ignorant of the original). I do like Bowie’s vocal on this and the Beatle-esque treatment the music receives. There’s only two words for the end track Bring Me The Disco King – MIKE GARSON! The man is a piano genius. 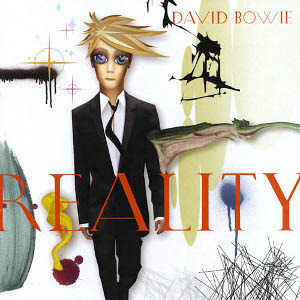 LOVE all his work with Bowie and his vocal mixed with Garson’s piano is gold. They are always so complementary. They just go together like, like, a hand in a glove (I dunno). Having listened to it for the first time in six years, I definitely would give it more listens, but might end up skipping certain tracks over time. I certainly like it more than I remembered and at the end of this Reverse Order Bowie experiment, I’ll have to see if my list will still remain in the order it’s in at the moment. That’ll be interesting!